Photius of Constantinople (ca. 810-893) is commemorated on this day. As an influential patriarch of this important eastern city, Photius could boast many educational, administrative, and evangelistic accomplishments. But in both East and West, the name of Photius will always be chiefly associated with that very split, the one between East and West. He excommunicated the Pope, and a western council anathematized him. He held the line against everything he thought was wrong with the theology and culture of the Western church, from their bungled liturgical calendar (Lent on Ash Wednesday? I am shocked!) to their celibate priests to the Filioque. What, you ask, is the Filioque? I’m so glad you asked. What follows is a moderately difficult explanation of it. Feel free to bail out when you’ve had enough; even though I’m simplifying things, there are shorter and simpler accounts available. The story of the Filioque (try saying it “feely-OH-kway”) is a complex saga of geopolitical scope and great doctrinal subtlety. What really split the Eastern and Western churches. The power struggles between the Holy Roman Empire and Byzantium, the increasing language barriers, the geographical difficulties of communication around the Mediterranean, the pressures from external invasions: all of these contributed to the eventual schism. In some ways, it’s your typical divorce story: they didn’t have a big fight until they had grown apart over a long course of time. But along with all of these problems, there were also genuine theological issues between East and West, and their role can’t be dismissed. The Filioque is the chief of them. Filioque is the Latin phrase meaning “and the Son” which was interpolated into the third article of the Nicene Creed by the Western church. By including it, the West specifies that the Holy Spirit proceeds not only from the Father (which is all the original text from 381 says), but from the Father and the Son. Nobody knows for sure where the Filioque came from; its first documented use was in 446 in Spain, and it spread through Germany quickly. Around this time, the Quicunque Vult (known as the “Athanasian Creed”) was also increasing in popularity, and it had been formulated with its own Filioque clause. There’s no reason to think that the Filioque was originally interpolated into the creed as a conscious alteration of the conciliar text. Western theology affirmed the doctrine itself, and the interpolation arose in regional liturgies almost unconsciously. Later Carolingian theologians, in defending the interpolation, devised theological justifications for it, but such “theologies of interpolation” were not present at the beginning: first there were Christian churches saying “I believe in the Holy Spirit, who proceeds from the Father and the Son,” and later there were arguments justifying the phrase. By the year 810, East and West woke up and recognized the difference in each others’ usages, and the fights began. The eventual schism is principally associated with the Photius, who saw the issue as decisive, and articulated the definitive Eastern rejection of the Filioque. Let’s admit that it’s pretty rude to add words to an ancient creed without making a special announcement. It has long been recognized that the unilateral Western addition of new text to the ecumenical creed is canonically impermissible. As early as 810, Pope Leo III adamantly refused (even in the face of pressure from Charlemagne) to alter the text of the Creed itself, although he affirmed the theology behind the Filioque; i.e. that the Spirit proceeds from the Father and the Son. In twentieth-century ecumenical discussions, there was a growing consensus that the unilateral interpolation was a mistake. But most Western churches defend the Filioque as an interpretive formula which gives necessary precision to the third article. This interpretive formula is set over against the Eastern interpretive formula, “ek mono tou patrou,” “and only from the Father,” and thus there are conflicting interpretations of pneumatology: filioquism and monopatrism. This theological question does in fact go to the heart of trinitarian theology, or at least to the distinct trinitarian theologies of East and West. Setting aside the question of the creedal interpolation (bad West! ), we can see the theological question itself as a recurring concern of the earlier church fathers. Particularly in the West, Hilary of Poitiers admitted that were many opinions on the subject of the procession of the Spirit, and that it was a subtle question of great complexity. Ambrose and Augustine also indicated that there were many parties with rival answers to this question. But explicit statements on the procession of the Spirit are incidental in the theology of the first three centuries of Christianity. It is with the developed theologies of the Cappadocians late in the fourth century, and Augustine in the fifth, that the theological divergence becomes evident. That Augustine is the theologian behind the Western view is obvious. His argument in favor of it at the conclusion of his De Trinitate was decisive for the Latin tradition. The Spirit derives from the common essence of the Father and the Son as their mutual love. It should be pointed out that Augustine readily admitted a sense in which the Spirit is from the Father principaliter or mainly; but this concession was rejected by Anselm, and later by Aquinas. In the theology of Aquinas, the Son and Spirit are the processions of knowledge and love within the divine subject; and since (following Aristotle) one can only love something that is already known, the Spirit (love) must be logically dependent on the Son (knowledge). This description in terms of “the metaphysics of notional act” is one of the ways in which the West has made it clear that there is a definite eternal relationship between the second and third persons of the Trinity, and it is a relationship in which the Spirit proceeds from the Son as well as from the Father. The East rejected the Western conception as soon as it heard of it. Photius’ polemic refuted the Filioque at every point, and saw it as a rejection of the personal distinctness of the Spirit. For Photius, it was axiomatic that any divine characteristic must belong either to one single trinitarian person, or to all three in common. This was, to his mind, absolutely necessary, and followed inexorably from the very distinction between essence and person. So to attribute a characteristic to the first and second persons, but not to the third person, was to confuse essence and person fatally. 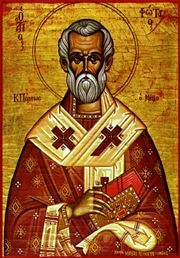 Photius seems to have had trouble deciding which heresy this Western idea amounted to: it appeared to lapse into all heresies at once, even contradictory ones. The Filioque split the Spirit in half, made the Spirit a hippocentaur, a divine grandson, collapsed Father and Son into one person, and excluded the Spirit from the divine essence. It was polytheistic, gnostic, Sabellian, Arian, and Pneumatomachian all at the same time. Photius’ controversial writings are rarely an edifying reading experience. The West remained adamant in its argument that only the Filioque could specify the eternal relation between the second and third persons. Photius for his part did not offer a compelling alternative. He admitted that within the economy of salvation, the Spirit proceeded from Christ. But he firmly denied that this economic, or salvation-historical origin implied an eternal inner-Trinitarian procession from the Son. Gregory II of Cyprus, in the 13th century, developed the Eastern theology further. Instead of halting in this opposition between the immanent and the economic Trinity, he proposed another kind of relation between the Son and Spirit, an eternal relation of manifestation rather than origin. The Spirit is manifest through the Son, or shines out through the Son by virtue of resting on the Son, but comes into existence from the Father alone. This manifestation, which he described as taking place eternally at the level of the divine energies, explains the economic sending of the Spirit through the Son. This developed Eastern conception, especially the distinction between essence and energies, was synthesized and perfected by Gregory Palamas in the following century, and became the official doctrine of the Orthodox church. As a package deal, it makes for a strong contrast with the developed Thomism of the 13th century West. The relationship between the Western and Eastern views is a complex subject which will not easily be resolved. Contemporary ecumenical discussion tends toward this solution: both churches affirm the same common basic dogma, but they each explicate it by means of different theological constructs. The constructs, or theologoumena (what a word! ), are not so much contradictory as just belonging to different and incommensurable conceptual systems. Thus East and West can coexist in diverse trinitarian theologies with a “legitimate complementarity.” This solution is of course not satisfactory to everyone on both sides. It tends to be more popular in the West than in the East, and even in the West it tends to be most popular among people who were inclined to minimize doctrinal differences anyway. One of the most significant issues surfaced by the conflict is the question of how to interpret the biblical information of the economy of salvation. Both East and West have developed theologies which enable them to be eclectic in their application of the economic events to their theologies of the immanent Trinity. The Eastern example is the one most frequently cited: that the Holy Spirit is sent by the risen Lord is beyond dispute exegetically. But the Palamite distinction enables Orthodox theology to restrict that sending to the level of uncreated energies, or of manifestation, meanwhile affirming that at the level of personal existence, the Spirit proceeds from the Father alone. The West, for its part, emphasizes the direct relation between the immanent and economic Trinity more explicitly, but is highly selective in its application of the identity. For instance, there has been relatively little development of the inner-Trinitarian implications of the fact that the Spirit conceives, sends, accompanies, and empowers the Son within the economic order. Would not purely formal consistency require a Spirituque clause in the second article? But who wants that? (Answer: Leonardo Boff. But don’t get me started) Western theology does not draw this conclusion, and Hans Urs Von Balthasar claimed that in this case we must speak of an “economic inversion” of the immanent Trinity. The disagreement over the Filioque, and the diverging theologies which it reveals, poses a challenge to contemporary trinitarian theology to take up some serious work on the doctrine of the Trinity. Increasingly, even among conservative evangelicals, the whole theology of eternal processions is being publicly questioned and rejected. Without eternal processions (an eternal sonship and an eternal procession of the Spirit as part of the Christian definition of God), the Filioque will inevitably be seen as a pseudo-problem. And for all the trouble it’s caused and all the unworthy arguments it has generated on both sides, it’s not a pseudo-problem. Speaking for myself, I affirm the theology of the Filioque but don’t think the phrase belongs in the Nicene creed. I’m also skeptical when Eastern theologians tell me that the Filioque is to blame for everything wrong with the West, or when Western theologians tell me anti-filioquism is the source of all the East’s problems. And finally, the way forward is bound to be greater concentration on how we ought to draw conclusions from the clear revelation of Scripture.